6-DVD collection includes THE HOBO, THE LUCKY DOG, THE SAWMILL, MUD AND SAND, WHITE WINGS, ORANGES AND LEMONS, THE SOILERS, SMITHY (THE HOME WRECKER), SHORT KILTS, KID SPEED, WEST OF HOT DOG, THE PAPERHANGER'S HELPER, HOP TO IT BELLHOP, YES, YES, NANNETTE, WIZARD OF OZ, SHOULD SAILORS MARRY?, ENOUGH TO DO, THUNDERING FLEAS, ALONG CAME AUNTIE, CRAZY LIKE A FOX, BROMO AND JULIET, HARD BOILED YEGGS, STOLEN JOOLS, THE FLYING DEUCES, THE TREE IN A TEST TUBE, UTOPIA and HOME MOVIES. From their separate careers as comic actors in the early years of silent filmmaking, to the formation of the comedy duo that saw them conquer the globe, this is the true story of Arthur Stanley Jefferson and Norvell 'Babe' Hardy, the world's greatest comedy double act better known to us all as LAUREL & HARDY! Stan and Ollie were true showbiz legends who featured in hundreds of films before teaming up together. Straddling the worlds of silent cinema, talkies, shorts, feature films and even cartoons, their talent is undeniable. With an appeal that transcends time, age and language, they enjoy a universal popularity that has never been topped. 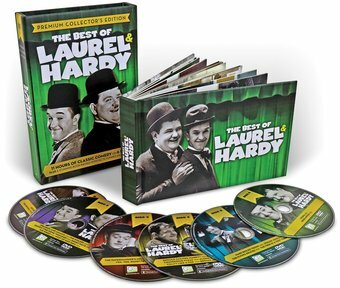 This lavishly illustrated book, packed with rare photographs and trivia, is the perfect complement to the accompanying six DVDs which feature an incredible selection of Laurel & Hardy material. From their earliest screen appearances to later gems such a The Flying Deuce and even home movies, this is the ideal collection for all lovers of classic comedy!